I met Max Baer, Sr. through his son, Max, Jr., whom I palled with when I lived in Sacramento in 1956. Max, Sr. was a gentleman and full of fun and life. One Sunday, he drove Max Jr. and me to a local movie theater. It was a cool day. When he saw I was shivering, he removed his brown suede jacket and insisted I wear it. Needless to say, I could stick out my elbows and barely have them reach the shoulders. I was very saddened when he passed three years later in Hollywood while I was overseas in the service. Max Baer (February 11, 1909 – November 21, 1959) was an American boxer of the 1930s (one-time Heavyweight Champion of the World) as well as a referee, and had an occasional role on film or television. He was the brother of heavyweight boxing contender Buddy Baer and father of actor Max Baer, Jr. (best known as Jethro Bodine on The Beverly Hillbillies). Baer is rated #22 on Ring Magazine’s list of 100 greatest punchers of all time. Maximilian Adelbert Baer was born on June 11, 1909 in Omaha, Nebraska to Jacob Baer (1875–1938), who was Jewish, and Dora Bales (1877–1938), who was of Scottish-Irish Protestant American ancestry. Baer was nominally raised in a nonsectarian home. Max led his public life as a Jew. Today the Reform and Reconstructionist branches of Judaism could consider Max Jewish because one of his parents was Jewish, while the Orthodox and Conservative branches of Judaism would not, because his mother was not Jewish. His eldest sister was Frances May Baer (1905–1991), his younger sister was Bernice Jeanette Baer (1911–1987), his younger brother was boxer-turned-actor Jacob Henry Baer, better known as Buddy Baer (1915–1986), and his adopted brother was August “Augie” Baer. In May 1922, tired of the Durango, Colorado winters, which aggravated Frances’s rheumatic fever and Jacob’s high blood pressure, the Baers drove to the milder climes of the West Coast, where Dora’s sister lived in Alameda, California. Jacob’s expertise in the butcher business led to numerous job offers around the San Francisco Bay Area. While living in Hayward, Max took his first job as a delivery boy for John Lee Wilbur. Wilbur ran a grocery store and bought meat from Jacob. Baer turned professional in 1929, progressing steadily through the Pacific Coast ranks. A ring tragedy little more than a year later almost caused caused him to drop out of boxing for good. Baer fought Frankie Campbell on August 25, 1930, in San Francisco in a ring built over home plate at San Francisco’s Recreation Park for the unofficial title of Pacific Coast champion. In the second round, Campbell clipped Baer and Baer slipped to the canvas. Campbell went toward his corner and waved to the crowd. He thought Baer was getting the count. Baer got up and flew at Campbell, landing a cheap shot right at Campbell’s turned head that sent him to the canvas. After the round, Campbell said to his trainer, “Something feels like it snapped in my head,” but went on to handily win rounds 3 and 4. As Baer rose for the 5th round, Tillie “Kid” Herman, Baer’s former friend and trainer, who had switched camps overnight and was now in Campbell’s corner, savagely taunted and jeered Baer. In a rage and determined to end the bout with a knockout, Baer soon had Campbell against the ropes. As he hammered him with punch after punch, the ropes were the only thing holding Campbell up. Herman, as Campbell’s chief second, had the option of throwing in the towel, but did not. Referee Toby Irwin seemed indifferent to Baer’s gratuitous attack, and by the time Irwin finally stopped the fight, Campbell collapsed to the canvas. Baer’s own seconds reportedly ministered to Campbell, and Baer stayed by his side until an ambulance arrived 30 minutes later. Baer visited the stricken fighter’s bedside, where he offered Frankie’s wife Ellie the hand that hit her husband. She took that hand and the two stood speechless for a moment. “It was unfortunate, I’m awfully sorry,” said Baer. “It even might have been you, mightn’t it?” she replied. At noon the next day, with a lit candle laced between his crossed fingers, and his wife and mother beside him, Frankie Campbell was pronounced dead. Upon the surgeon’s announcement of Campbell’s death, Baer broke down and sobbed inconsolably. Brain specialist Dr. Tilton E. Tillman declared death had been caused by a succession of blows on the jaw and not by any struck on the rear of the head, and that Campbell’s brain had been “knocked completely loose from his skull” by Baer’s blows. The Campbell incident earned Max the reputation as a “killer” in the ring. This publicity was further sensationalized by Baer’s return bout with Ernie Schaaf, who had bested Baer in a decision during Max’s Eastern debut bout at Madison Square Garden on September 19, 1930. My father cried about what happened to Frankie Campbell. He had nightmares. In reality, my father was one of the kindest, gentlest men you would ever hope to meet. He treated boxing the way today’s professional wrestlers do wrestling: part sport, mostly showmanship. He never deliberately hurt anyone. In the case of Campbell, Baer was charged with manslaughter. Baer was eventually acquitted of all charges, but the California State Boxing Commission still banned him from any in-ring activity within the state for the next year. Baer gave purses from succeeding bouts to Campbell’s family, but lost four of his next six fights. He fared better when Jack Dempsey took him under his wing. Hitler summoned Schmeling for a private meeting in April, where he told Schmeling to contact him for help if he had any problems in the U.S., and requested that during any press interviews, he should tell the American public that news reports about Jewish persecution in Germany were untrue. However, a few days after that meeting, Hitler put a national ban on boxing by Jews along with a boycott of all Jewish businesses. When Schmeling arrived in New York, he did as Hitler requested, and denied problems of anti-Semitism existed, adding that many of his neighbors were Jews, as was his manager. Baer became a hero among Jews, those who identified with Jews, and those who despised the Nazis. According to biographer David Bret, after the war ended, it was learned that Schmeling had in fact saved the lives of many Jewish children during the war while still serving his country. Swedish film star Greta Garbo considered Baer’s defeat of Schmeling to be a “mini-victory” over German fascism, and she invited him to visit her while she was filming Queen Christina in Hollywood, which led to a romance. Their relationship lasted until he had to return to New York to train for his next fight, against Primo Carnera. 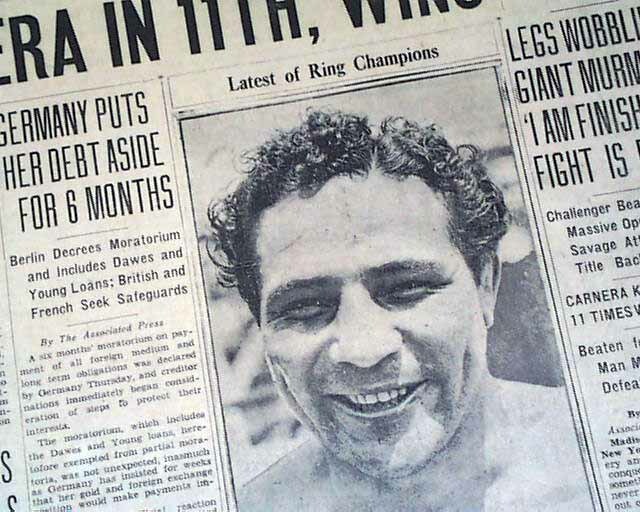 On June 14, 1934, Baer, after knocking him down 11 times, won by technical knockout over the massive, 275-pound (125-kg) Primo Carnera, Heavyweight Champion of the World, to win the world title, which he would hold for 364 days. Max undoubtedly paid the penalty for underestimating his challenger beforehand and wasting too much time clowning. 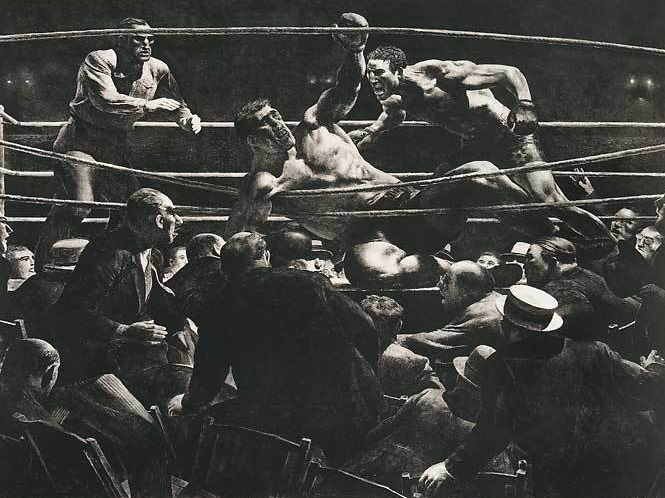 At the end of 15 rounds Braddock emerged the victor in a unanimous decision, outpointing Baer 8 rounds to 6 in the “most astounding upset since John L. Sullivan went down before the thrusts of Gentleman Jim Corbett back in the nineties.” Braddock took heavy hits from Baer, but kept coming at him until he wore Max down. Baer and his brother Buddy both lost fights to Joe Louis. In the second round of Max’s September 1935 match, Joe knocked Baer down to one knee, the first time he had ever been knocked to the canvas in his career. A sizzling left hook in the fourth round brought Max to his knee again, and the referee called the bout soon after. It was learned weeks later that Baer fought Louis with a broken right hand that never healed from his fight with Jimmy Braddock. Max was virtually helpless without his big right hand in the Louis fight. In the first televised heavyweight prizefight, Baer lost to Lou Nova on June 1, 1939, on WNBT-TV in New York. Baer was awarded a belt declaring him the “White Heavyweight Champion of the World” after he scored a first round T.K.O. over Pat Cominsky in a bout at Roosevelt Stadium in Jersey City, New Jersey on 26 September, 1940, but it was a publicity stunt. The fight was not promoted as being for a “white heavyweight championship,” and Cominsky would not have won the belt had he beaten Baer. The belt was a publicity stunt dreamed up by boxing promoters who were trying to pressure promoter Mike Jacobs into giving the ex-world heavyweight champion a rematch with current champ Joe Louis. Jacobs refused. 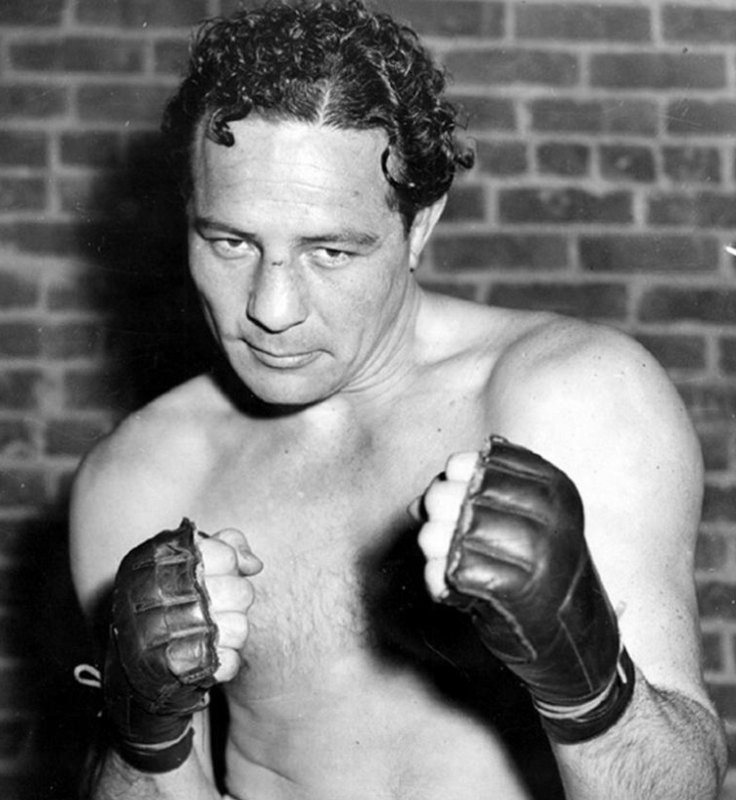 Baer retired after his next fight, on 4 April 1941, when he lost to Lou Nova on a T.K.O. in the eighth round of scheduled 10-rounder at Madison Square Garden. Nova did get a shot at Louis. Max Baer boxed in 84 professional fights from 1929 to 1941. In all, his record was 71–13–0. 53 of those fights were knockouts, making him a member of the exclusive group of boxers to have won 50 or more bouts by knockout. Baer defeated the likes of Ernie Schaaf, Walter Cobb, Kingfish Levinsky, Max Schmeling, Tony Galento, Ben Foord, and Tommy Farr. He was Heavyweight Champion of the World from June 14, 1934 to June 13, 1935. Baer was inducted into the Boxing Hall of Fame in 1968, the World Boxing Hall of Fame in 1984, the International Boxing Hall of Fame in 1995, and the International Jewish Sports Hall of Fame in 2009. The 1998 Holiday Issue of Ring ranked Baer #20 in “The 50 Greatest Heavyweights of All Time.” In Ring Magazine’s 100 Greatest Punchers (published in 2003), Baer is ranked number 22. Baer’s motion picture debut was in The Prizefighter and the Lady (1933) opposite Myrna Loy and Walter Huston. In this MGM movie he played Steven “Steve” Morgan, a bartender that the Professor, played by Huston, begins training for the ring. 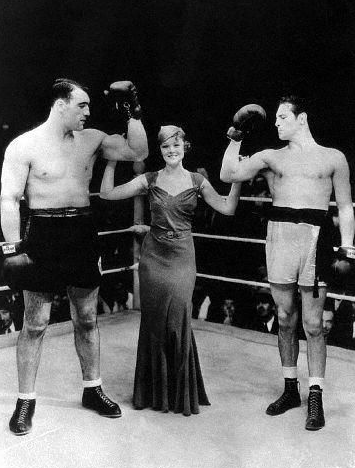 Steve wins a fight, then marries Belle Mercer, played by Loy. He starts seriously training, but it turns out he has a huge ego and an eye for women. Featured were Baer’s upcoming opponent, Primo Carnera, as himself, whom Steve challenges for the championship, andJack Dempsey, as himself, former heavyweight champion, acting as the referee. On March 29, 1934, The Prizefighter and the Lady was officially banned in Germany at the behest of Joseph Goebbels, Adolf Hitler‘s Minister of Propaganda and Public Entertainment, even though it received favorable reviews in local newspapers as well as in Nazi publications. When contacted for comment at Lake Tahoe, Baer said, “They didn’t ban the picture because I have Jewish blood. They banned it because I knocked out Max Schmeling.” Baer enlisted, as well as his brother Buddy, in the United States Army when World War II began. Baer acted in almost 20 movies, including Africa Screams (1949) with Abbott and Costello, and made several TV guest appearances. A clown in and out of the ring, Baer also appeared in a vaudeville act and on his own TV variety show. Baer appeared in Humphrey Bogart‘s final movie, The Harder They Fall (1956), opposite Mike Lane as Toro Moreno, a Hollywood version of Primo Carnera, whom Baer defeated for his heavyweight title. 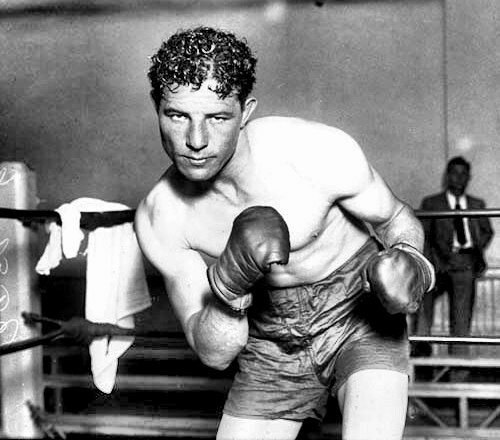 Budd Schulberg, who wrote the book from which the movie was made, portrayed the Baer character, “Buddy Brannen”, as bloodthirsty, and the unfounded characterization was reprised in the movie Cinderella Man. 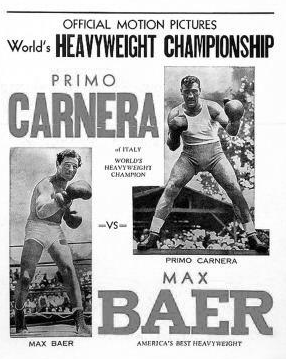 In 1951, Baer teamed up with another titleholder, friend, Light Heavyweight Champion (1929-’34), and boxer-turned actor/comedian, Maxie Rosenbloom. Together, the two starred in SkipAlong Rosenbloom (written by Rosenbloom). They embarked on a comedy tour, billed as “The Two Maxie’s.” Baer would also take the stage at Rosenbloom’s comedy club on Wilshire Blvd, Slapsy Maxie’s, which was featured in the film Gangster Squad. Baer and Rosenbloom remained friends until Baer’s death in 1959. Baer additionally worked as a disc jockey for a Sacramento radio station, and for a while he was a wrestler. He served as public relations director for a Sacramento automobile dealership and referee for boxing and wrestling matches. Baer married twice, to actress Dorothy Dunbar (married July 8, 1931-divorced October 6, 1933), and to Mary Ellen Sullivan (1903–1978), married June 29, 1935-his death 1959), the mother of his 3 children: actor Max Baer, Jr. (born 1937), James Manny Baer (born 1942), and Maudie Marian Baer (born 1944). Baer never got to see his son perform as an actor on television. Max Baer Jr., played Jethro Bodine in the television series The Beverly Hillbillies and appeared on several other shows. At the time of his death on November 21, 1959, Baer was scheduled to appear in some TV commercials in Los Angeles before returning to his home in Sacramento. On Wednesday, November 18, 1959, Baer refereed a nationally televised 10-round boxing match in Phoenix. At the end of the match, to the applause of the crowd, Baer grasped the ropes and vaulted out of the ring, then joined fight fans in a cocktail bar. The next day, he was scheduled to appear in several television commercials in Hollywood. On his way, he stopped in Garden Grove, California, to keep a promise he had made thirteen years earlier to the then five-year-old son of his ex-sparring partner, Curly Owens. Baer presented the now 18-year-old with a foreign sports car on his birthday, as he had said he would.